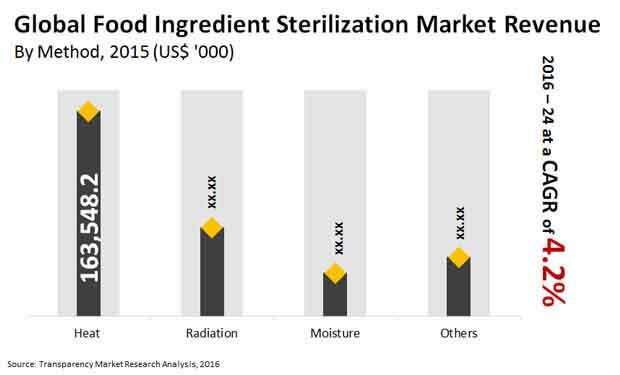 Prominent participants in the global food ingredient sterilization market are Sterigenics International LLC, Balchem, Inc., Safe Spice, Croll Reynolds, and Wenda Ingredients. Some of them are into specialty products in the domain of healthcare and food and beverages industries. In a report on the market by Transparency Market Research, it is stated that it would likely rise at a steady 4.2% CAGR over the course of the forecast period starting from 2016 and ending in 2024. At this rate, the market which was worth US$326,069 mn in 2016, would likely become worth US$452,046.9 by the end of 2024. There are quite a few methods adopted for food ingredients sterilization. Those include usage of heat, radiation, moisture, and others. Currently, the heat-based sterilization is seeing maximum uptake for increasing the shelf life of products. It prevents contamination. Further, to thwart toxin production inside a container in a store or while being transported, the producers of packaged food often resort to microwave-assisted thermal sterilization technology. From a geographical standpoint, Europe and North America lead the market because of the strict regulations on food safety and also the massive demand for packaged food in the region. The region is being mainly powered by Canada and the U.S.
Several cases of health issues resulting from contaminated food has stoked the market for food ingredient sterilization. Those include numerous food poisoning cases. Apart from causing inconvenience to consumers they also affect the image of a company. In order to avoid such problems, companies are seen increasingly resorting to food sterilization. The process not just serves to stamp out harmful bacteria in the food but also prolong their shelf life. Further, it helps companies avoid protracted and costly legal battles on account of undercooking, improper processing, and contamination. Despite such benefits, not many are aware of the benefits of food ingredient sterilization and this is hampering revenue growth to a degree. In addition, lack of trained personnel to carry out the procedure in an appropriate manner and malfunction of equipment is also a drawback dragging down market growth. Nevertheless the market is expected to rise steadily in the next few years on the back of constant product development. With more sophisticated food ingredient sterilization equipment being launched from time to time, new growth avenues will open up. A noticeable trend in the market is savvy players setting their gaze upon emerging economies of Asia Pacific such as India and China. With their large populations, they spell major opportunities.